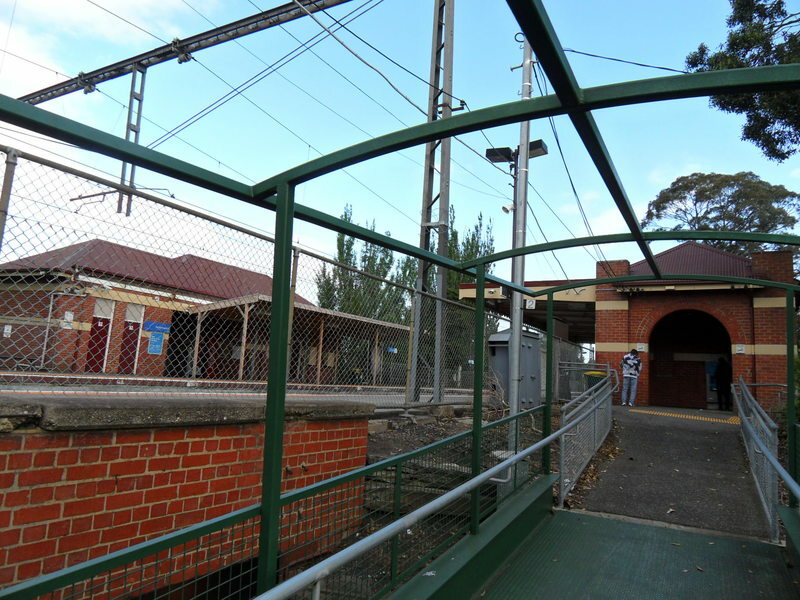 The Newmarket Railway Station complex, which comprises the Up and Down station buildings and platforms as constructed in 1925, the steel lattice stanchions supporting the overhead wiring dating from c.1919, the pedestrian subway with brick walls and bluestone coping and the bluestone bridge abutments and piers to Racecourse Road to the extent of the nineteenth century fabric, and the mature trees in the adjoining reserves dating from c.1920s, is significant. The station buildings are constructed of brick with hipped roofs, originally tiled but now clad in red colourbond. The buildings have detailing typical of Edwardian era stations such as the rendered bands at mid-wall level and eaves height, the arched windows and entries, and the surviving cantilevered steel awning to the Down side building, with ripple-iron valance, scalloped along the front. Each building has a central section with a similar, symmetrical outward-facing elevation divided into three bays by pilasters that rise above eaves height to become pylons at the corners and to frame a stepped parapet at the centre, punctuated by the roof. The outer bays contain arched openings (on the Up side, both are windows, and on the Down, one is the lobby entrance) on either side of a tall rectangular window. Decorative terracotta tiles with floral motifs are placed at the top corners of the central window and the top corners of the central parapet. With the exception of one window on the Up side building, all of the windows have been removed or covered over. On the Down side building the central section is flanked on the north side by the arched entrance to the lobby, which is also framed by pylons on each corner, and by a hipped roof wing on the south side that originally contained waiting rooms and toilets. On the Up side building, there is a hipped roof section on the north side while the open lobby retains what appears to be an original timber bench seat along one wall. The platform retains the brick facing with concrete coping facing the railway, and precast reinforced concrete panels on the outer walls. 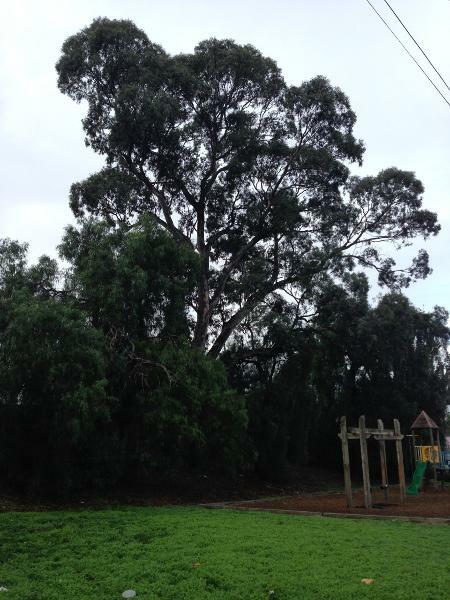 Mature trees surrounding the station include several Peppers (Schinus molle), Silver or White Poplars (Populus alba) and a River Red Gum (Eucalyptus camaldulensis), mostly to the south of the buildings with one Pepper at the north end of the Down side platform and a large Fig (Ficus sp.) adjacent to the ramp leading to the Down side building entrance. Non-original alterations and additions to the complex are not significant. 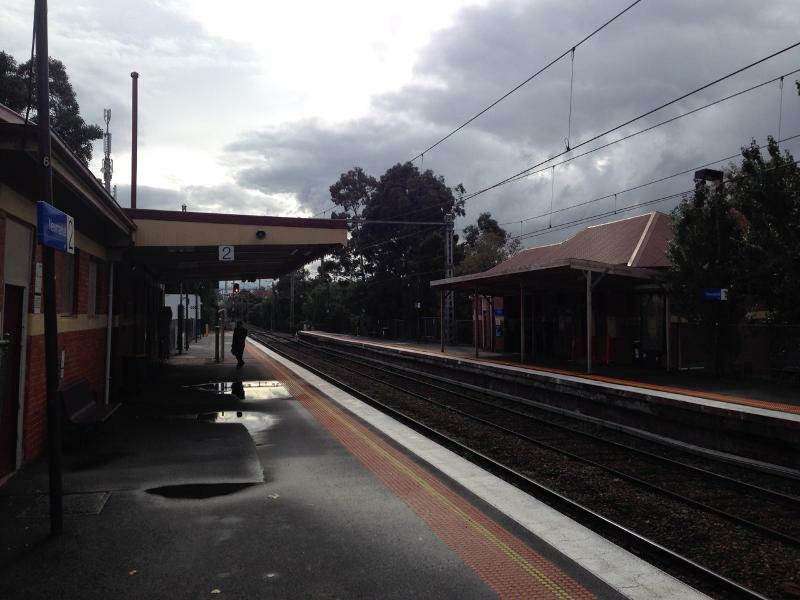 The Newmarket Railway Station complex is of local historic and aesthetic significance to the City of Moonee Valley. 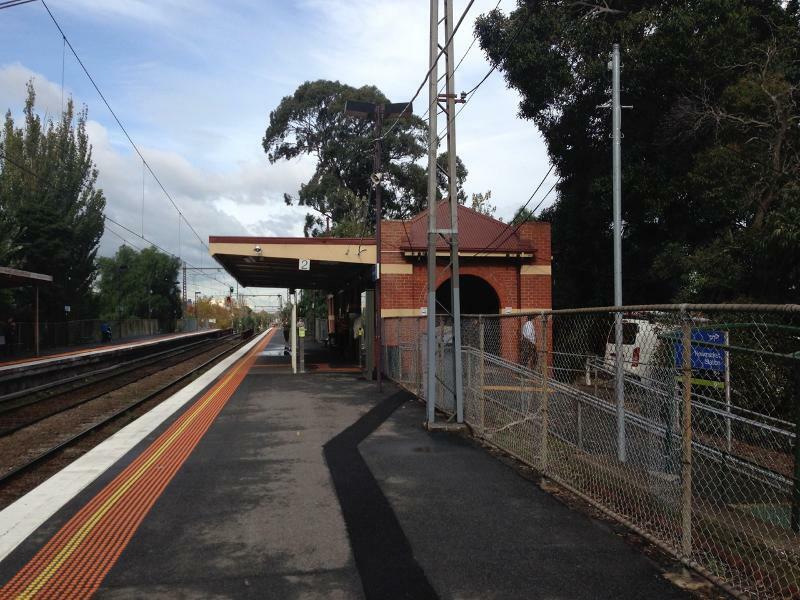 The Newmarket Railway Station is situated on a high embankment on the north side of Racecourse Road. The railway crosses Racecourse Road on a steel plate girder bridge with bluestone abutments and piers, of which the northern half is situated within the City of Moonee Valley (the southern half is within the City of Melbourne). 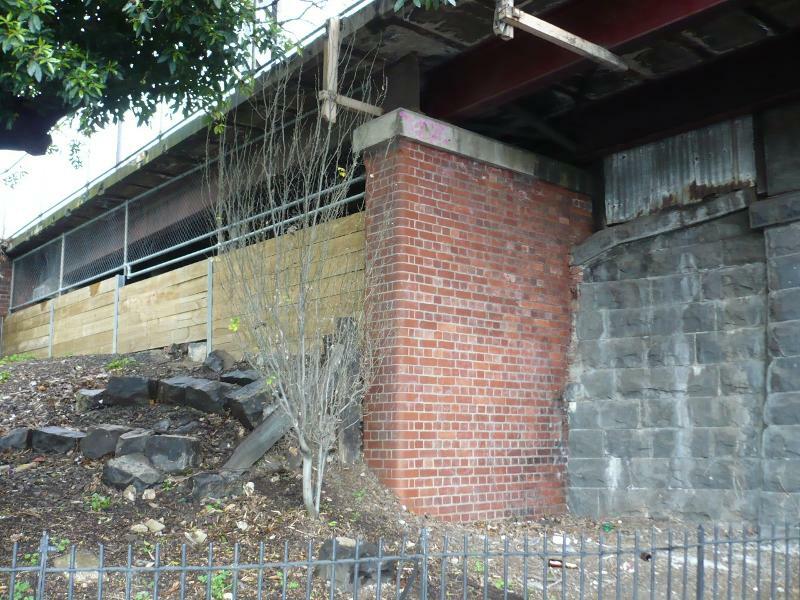 Part of the abutment on the Down (west) side has been removed to accommodate the station platform, which was extended in 1925. The station buildings are constructed of brick with hipped roofs, originally tiled but now clad in red colourbond. The style of the buildings show the transition from the Edwardian era stations constructed prior to World War I. This can be seen in details such as the rendered bands at mid-wall level and eaves height, the arched windows and entries, and the surviving cantilevered steel awning to the Down side building, with ripple-iron valance, scalloped along the front. Each building has a central section containing the original booking & parcels office and lobby with flanking hipped roof wings. The central section of each building has a similar symmetrical outward facing elevation divided into three bays by pilasters that rise above eaves height to become pylons at the corners and frame a stepped parapet at the centre, and are punctuated by the roof. The outer bays contain arched openings (on the Down side, both are windows, and on the Up, one is the lobby entrance) on either side of a tall rectangular window. Decorative terracotta tiles with floral motifs are placed at the top corners of the central window and the top corners of the central parapet. With the exception of one window on the Up side building, all of the windows have been removed or covered over. The central section of the slightly larger Down side building is flanked on the north side by the arched entrance to the lobby, which is also framed by pylons on each corner, and by a hipped roof wing on the south side that originally contained waiting rooms, toilets and the porter's room with high set windows positioned within the horizontal render banding. 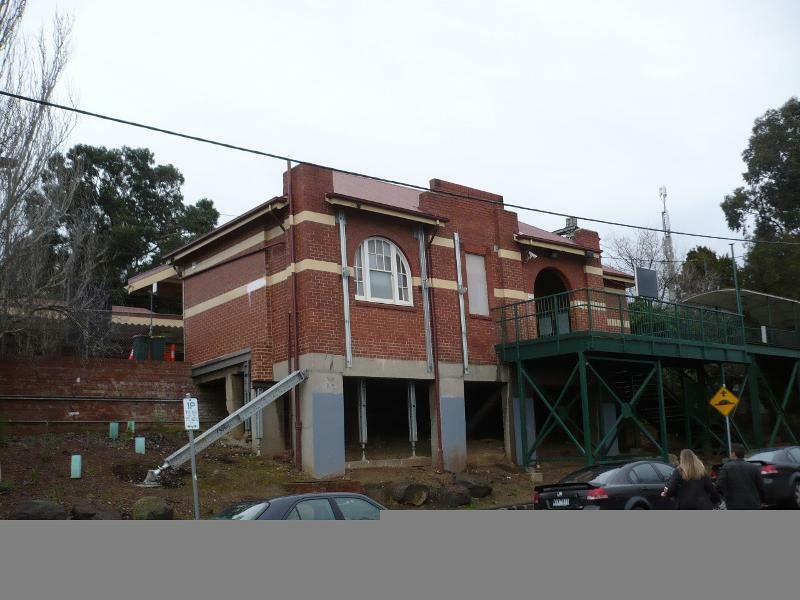 On the Up side building, the hipped roof wing on the north side once contained the general or men's waiting room and now contains men's and women's toilets. It has high set windows positioned within the horizontal render banding. The open lobby within the central section retains what appears to be an original or early timber bench seat along one wall. 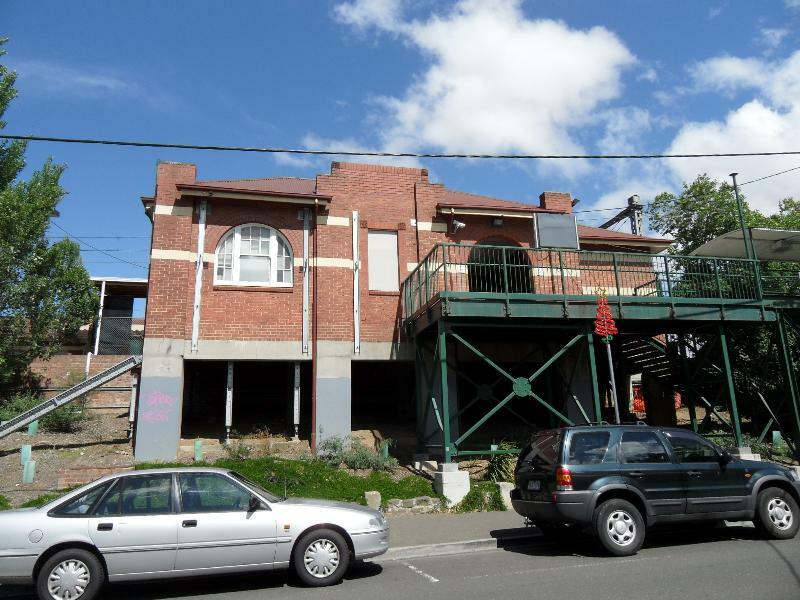 The most significant change to the station is the demolition of the wing on the south side of the Up side building that contained the Ladies waiting room and toilets for both sexes and the removal of the awning to that building. Other visible alterations include the replacement of the original roof tiles with colourbond, removal of chimneys, replacement or covering/bricking up of most windows (with the exception of the arched window in the Up side building as noted above) and some doorways, and the replacement of the original timber ramps and steps to the Up side building. 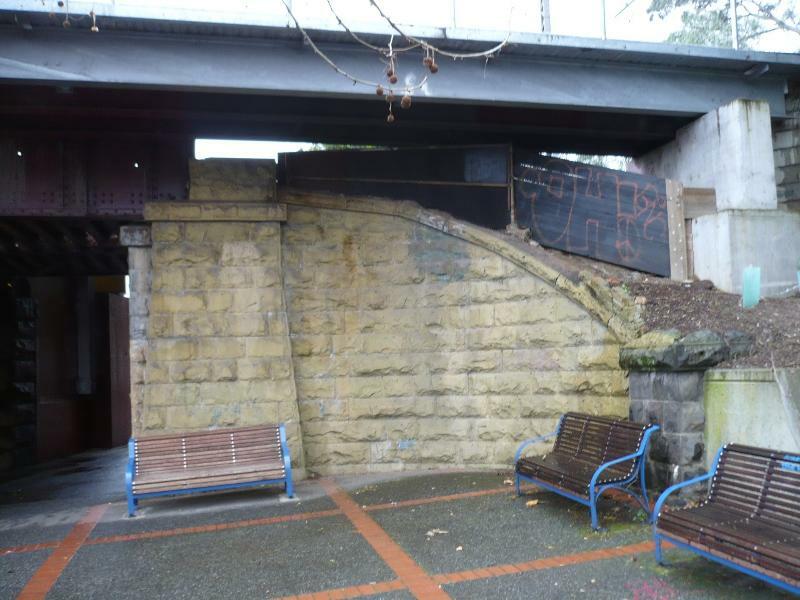 The platform retains the brick facing with concrete coping facing the railway, and precast reinforced concrete panels on the outer walls as constructed in 1925. Contained within the platforms are two sets of lattice stanchions that support the overhead wires, which appear to date from the interwar period and may be the original ones erected as part of the electrification scheme. 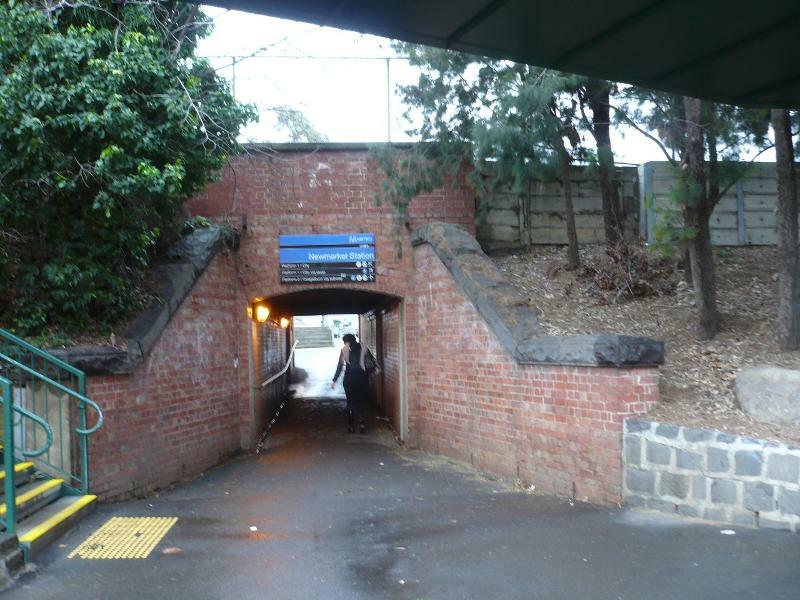 The pedestrian subway, which appears to pre-date the station buildings, has red brick walls (now overpainted on the west side) with bluestone coping. Later (probably post-war) additions on the west side comprise concrete walls with bluestone blocks. 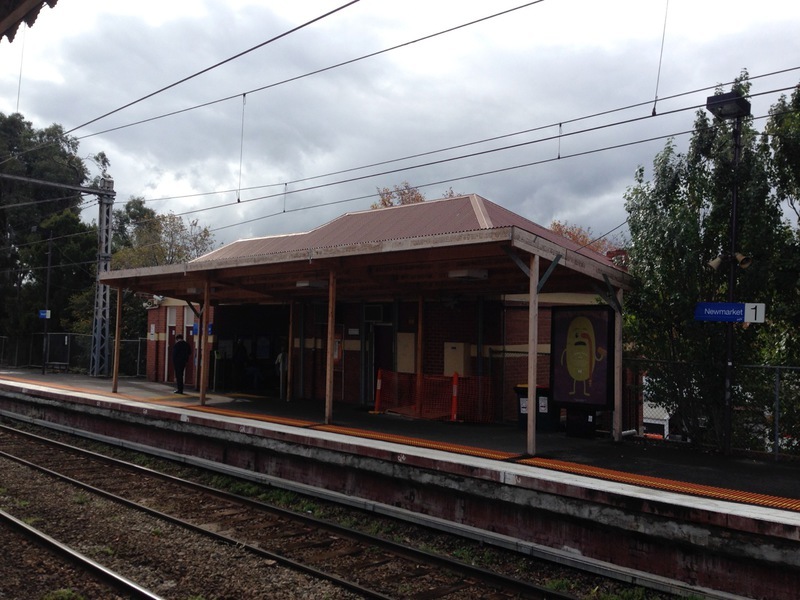 Mature trees surrounding the station that are probably associated with VR landscaping schemes include several Peppers (Schinus molle), Silver or White Poplars (Populus alba) and a River Red Gum (Eucalyptus camaldulensis), mostly to the south of the buildings with one Pepper at the north end of the Down side platform and a large Fig (Ficus sp.) adjacent to the ramp leading to the Down side building entrance. The railway station complex forms part of the historic commercial centre in Racecourse Road and Pin Oak Crescent. The railway bridge is a landmark within the centre and defines the historic western boundary. The shops along Pin Oak Crescent, which date from the late Victorian to interwar periods provide a related setting for the station.